So many of our statements nowadays end with ‘the world as we know it’. 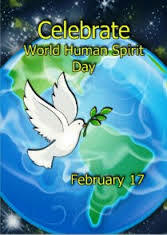 World Human Spirit Day is a celebration of the fact that what we know about our own world is limited and superficial. It is a day to wonder at our achievements on this planet as humans, and to contemplate the endless possibilities we have as spirits. A day to search within for contentedness and to embrace the fact that we do not have all the answers and that may be for the best. A day to give a higher power thanks for what we have and what we don’t have, for making us who we are and for giving us the ability to touch others. This day is a celebration of continuity, of hope, of awareness, an occasion for us all to connect spiritually, to gaze at the universe beyond our worldly bodies. 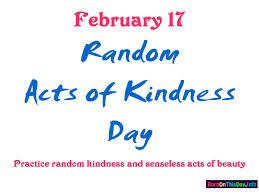 There’s no better time to help a pensioner to cross the road than on Random Acts Of Kindness Day. Of course, crossing assistance is only one of the ways that you can show kindness and assistance to those around you – get creative in finding small ways to make a difference and to make somebody smile!